Kitten Sanctuary is rated 4.3 out of 5 by 11. Rated 5 out of 5 by OhHelloSugar from Cute and fun! This is my favorite Match game! The music is low-key and relaxing, even in "challenge" levels. The graphics are simple but charming; all of the kittens are adorable and will make you want to save them and care for them. The added bonus of being able to play with the kittens and keep them happy is a nice, fun touch. I love this game, and definitely recommend it for Match game fans and cat lovers alike! Rated 5 out of 5 by xandrakittiluv from I LOVE CATS I love cats and playing this game brought my love of cats to a whole new level! Each level I play , I'm thinking " Aww ... I'll save you!" Which keeps me addicted because I want to save the cats. Please ... creators of Kitten Sanctuary ... CREATE ANOTHER CAT GAME! Rated 5 out of 5 by zionluvsjesus from Adorable kitty lovers game! I absolutely love this game! I am a cat lover so that also plays a factor. It's true, its not a very challenging game, but it's loads of fun to play and it's very laid back and kid appropriate. I would tottaly recommend this game for someone who has small children and likes those types of games where you take care of animals. It is a very engrossing and satisfying game. You should try it sometime. 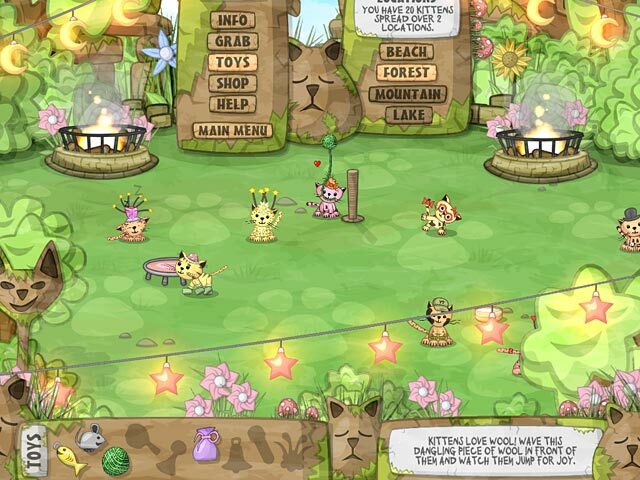 Rated 5 out of 5 by philadel from Any child/adult who likes nintendogs etc, will love this... A brilliant combination of challenging, or casual match 3 play, and once a kitten is rescued after each level, it becomes part of your kitten family who you can feed, play with, care for, shop for, an lots more. Most children will like this game just for that feature alone. the match 3 is an excellent bonus! having played puppy sanctuary, from the same genre, i am happy to find kitten sanctuary. Heres hoping there will be many more sanctuarys to come. My child in particular will be monitoring Big Fish from now on in the hopes that a monkey sanctuary, or possilbly penguin sanctuary (loves club penguin), will one day appear on the section "new releases". Rated 4 out of 5 by luvatrivia from Cutest Kittens Ever A match 3 game: Save the poor kitties the Aliens have trapped in the cage. Fun light hearted be happy game. Relaxing play with a lot of bells and whistles and actions. I love the sounds of the explosions. Kids also would love this game. The Aliens try all kind of devious things to keep you from rescuing the kittens. You match items like milk in bottles and canned kitty food. Your rescued kittens are put in settings like beach and forest. They all have cute names and biographies. (Which are funny and make me laugh. )They play, flip somersaults and walk around their little enclosures; It is such stress- relieving and fun to watch their antics. I sometimes watch them and skip the game part.I even made a list on paper with their names and descriptions to learn them so I could tell which cat was which. All the cats have different personalities you can see as you watch them. You purchase toys in the shop and play with the cats. I especially love how they pounce on the little wind-up mice you let loose. Hearts are used for their up and down moods. Things will make the Kitties have fewer hearts like having a cold. You can use toys to lift their Spirits until they get a higher heart count. They love being brushed. The only thing about the game I am disappointed with is that you buy the approx. 8-10 toys, and at least for me, I cannot find anything more to use my coins on. The reason I gave the game a 4 instead of a 5. 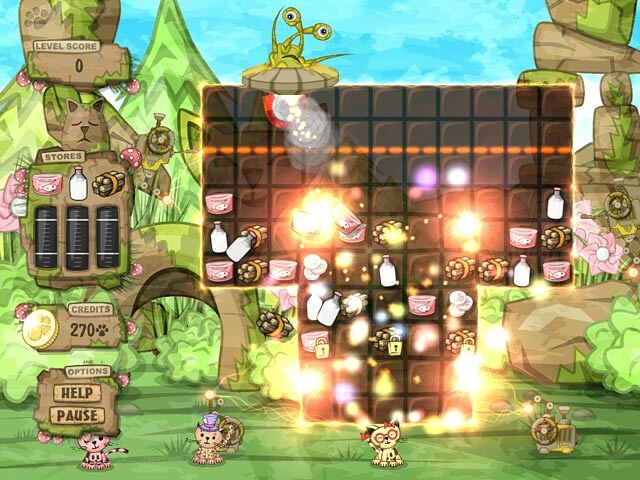 Rated 4 out of 5 by arnold1049 from JUST FOR KIDS I only played about 20 minutes of the demo before I realized that this game is not for adults, but a great game for very young children. Some games can appeal to older children and adults; this is not one of them. Kittens are being captured by space aliens and must be rescued. Once rescued, the kittens must be placed in a sanctuary for their protection. There are 4 sanctuaries; new ones open up as the game advances. Once rescued, the goal of the game is to keep the kittens happy. The Match 3 play is very easy with big tiles and bright objects on the tiles. The grids have fewer tiles and are big and easy to see. The game can be played either timed or no time, making it even easier for very young children. Powerups are plentiful and easy to earn. Tiles do not slide; each move requires two clicks. Tiles can be swapped diagonally, which helps expand the search for matches. The kittens are cute and playful. There are lots of extras, like earning food, wood and coins during play. Coins can be used in the store to purchase items to "play" with the kittens. I recommend this game FOR KIDS ONLY. Rated 4 out of 5 by Riba_Soma from A Match 3 Game About Kittens. Enough Said! 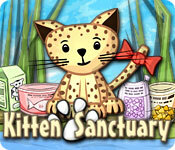 "Kitten Sanctuary" is a sweet casual match 3 game with several goals. Firstly, match 3 mechanics that are not quite standard: this game allows cross moves. Then, there are missions - you have to save kittens from "pesky aliens". Meanwhile, you collect supplies for kittens and entertain them with toys. Personally I greatly enjoyed match 3 puzzles and the kitten care. The alien mission storyline is a bit too weird, and aliens look really ugly partly because of pseudo 3D and visual effects. I would love to see a modern remake of this game with better graphics and, of course, more kittens! Rated 4 out of 5 by Rebr2009 from Very Cute Family Game An excellent game to play with children! Kittens are so lovely that makes you go ahead only to see the next. Kids will want to care for and feed the kittens, as well as protect them from aliens. Very colorful, gorgeous graphics, good music. It has three difficulty levels and two modes of tile movement - standard and dynamic. But in general, the game is not very challenging. Rated 4 out of 5 by OldLady12 from Relaxing game This game is fun and relaxing. If not playing the match game, you can play with your family of kittens. It's fun to play with the various toys to keep the kitties happy. You can even brush them to make them purr! Very relaxing. There are many levels, so the game can keep you and/or your kids happy for hours! Rated 4 out of 5 by fancyfish from Worth trying! Lots of levels. Very cute, fun.and entertaining. Hard to play this and not smile. My only complaint is that sometimes it's hard to click the tiles to match and you have to do it more than a few times for it to work. Save the Kitten Sanctuary from evil alien abductors! 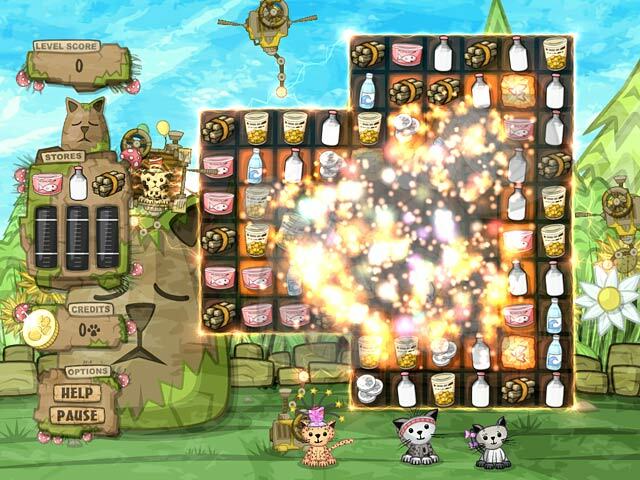 Use your Match 3 skills to destroy the aliens` evil traps and free kitties!